Image Size: 21.5" x 26.5"
Paper Size: 25.5" x 30.5"
In probably the most critical test of the as yet untried Space Shuttle, the orbiter "Enterprise" is released from its highly modified 747 carrier aircraft for its approach and landing test in actual flight configuration. Without the streamlined tailcone used on previous test flights there would be increased buffeting on the 747 shuttle carrier and the descent profile for the orbiter would be much steeper. 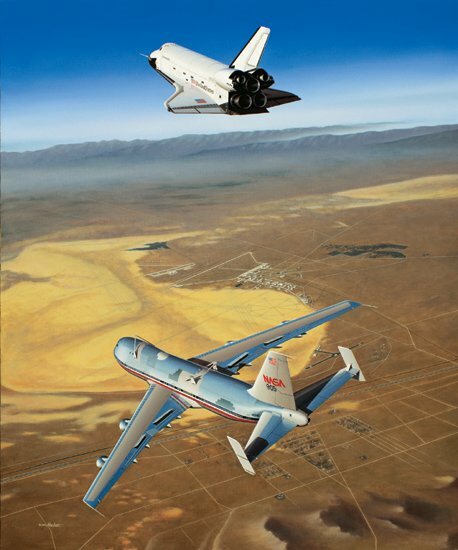 At 20,300 feet shuttle pilot Joe Engle released the orbiter from the carrier aircraft and NASA 747 pilot Fitz Fulton banked the Jumbo steeply away from the orbiter. Previous tests with the tailcone installed had required 5 1/2 minutes for the orbitor to reach their Edwards runway but today that descent took only 2 minutes and 34 seconds. Personally autographed by Shuttle pilot Major General Joe H. Engle and Shuttle Carrier Command pilot Fitzhugh L. "Fitz" Fulton.